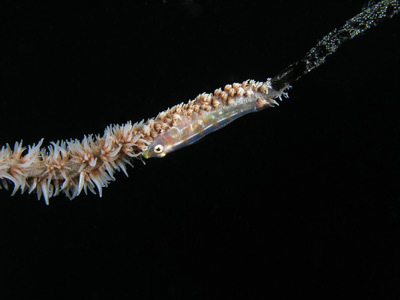 This dive is one of the closest dive sites to Kavieng in the New Ireland Province of Papua New Guinea. It is only a bit over five minutes run from Nusa Resort to this site. 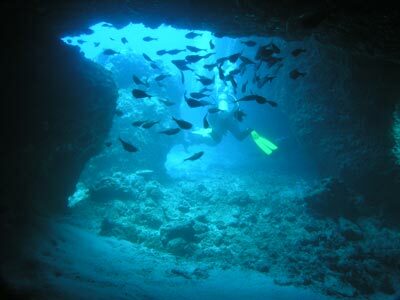 The dive site is located on the western side of Nusa Island (which is the bigger island to the north of Nusalik Island on which Nusa Resort is located). The dive site is basically a drift along the section of coast from about 300 metres north of the northern point of the small bay on this side of the island. As you are likely to do this as a second dive, probably after diving the wreck of the Der Yang you will probably spend your surface interval at the mooring. I would recommend snorkelling ashore and walking down the beach to a spot roughly adjacent to the mooring and going into the jungle. Behind the beach there are two large Japanese artillery guns here in emplacements. It is very interesting if you are into things like that (as I am). Anyway, as mentioned this dive is a drift and depending on the current, you may do starting from the mooring or ending up at the mooring. As the current was heading south, we started about 300 metres north and headed back to the mooring. Once geared up, we were dropped off the edge of the island and dropped down the reef. 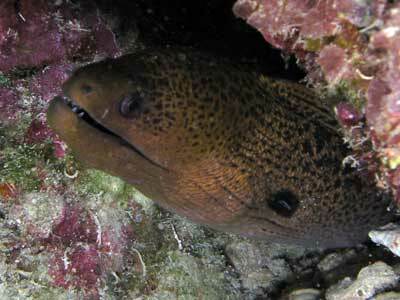 The depth in the shallows is only five metres or so and the reef sloped steeply to 20 metres. The bottom is sand. The current is slight, easily able to be swum against. 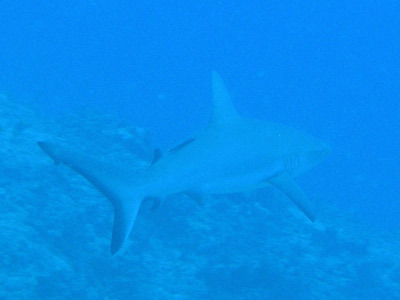 Almost as soon as reaching the bottom, a reef shark swims past. Soon after, an eagle ray goes off from the reef out into deeper water. A bit further along is another shark, this time a black-tipped reef shark. Large schools of trevally are see, as well as two giant trevally. Kelly and I missed out on seeing the eight sharks that were lying on the sand a bit further on. 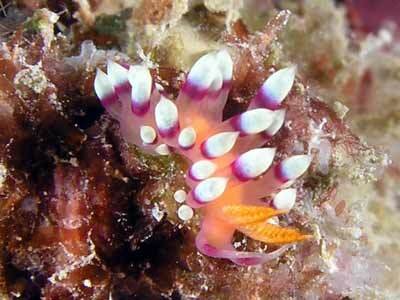 The reef itself has some nice gorgonias and sponges. A couple of hundred metres on we come to an overhang. Back up in the southern corner between the wall and a large rock is a low cave that gives its name to this dive site. It is a sandy bottom and the cave is perhaps two metres high at the most. Right up the back there are dozens of lobsters. However, it is look and do not take! From here you come back out of the cave and keep going south. 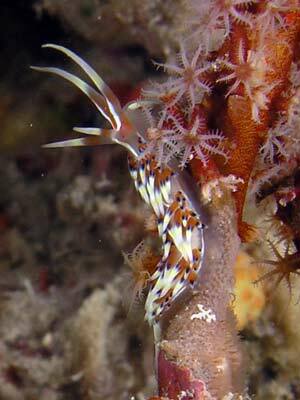 The slope from the shallows is fairly bare here, but there are lots of nudibranchs. Just before the mooring there is another overhang. Here there were quite a few garfish right under the surface. 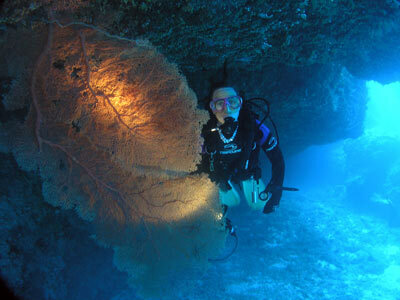 You finish your dive under the mooring in the shallow water. 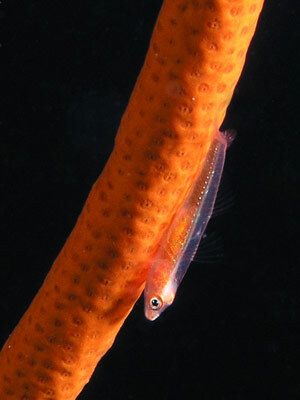 The visibility on this dive is about 25 metres and the water temperature 19°C. A very nice easy dive.